Along with the rise of anti-Semitism in Muslim and Arab communities, there’s growing hostility to France’s Muslims within the Jewish community, which draws its source in the defense of Israel. On March 23 in Paris, Mireille Knoll, an 85-year-old Jewish woman, was found dead in her apartment. Her body was partly burned from a fire that had been set, but the autopsy showed that she had been stabbed several times in the throat. Two men were quickly arrested. One of them, Yacine Mihoub, is the 28-year-old son of a neighbor of the victim. An alcoholic, he has had a history of psychiatric disorders and spent six months in prison, from which he was released in September 2017, for sexually molesting the 12-year-old daughter of Knoll’s care provider. He personally knew Knoll and spent the day of the murder in her apartment, drinking heavily. In the late afternoon, his sidekick, a 21-year-old drifter named Alex Carrimbacus, whom he had met in prison, came to the apartment after Mihoub had called him. What precisely happened in the apartment is still not clear, with both men accusing the other of having killed the elderly lady and then setting the fire. Carrimbacus affirms that he heard Mihoub yell, “Allah akbar!” Yacine swears that Alex is the murderer. Knoll’s murder is the latest in a series of macabre crimes to afflict the Jewish community. The French interior minister, Gérard Collomb, immediately declared that Yacine Mihoub is “not at all” linked to a jihadist organization. But the Representative Council of French Jewish Institutions (CRIF) quickly presented the affair as an anti-Semitic crime. CRIF president Francis Kalifat called for a marche blanche—a silent march—in honor of the victim and to denounce the resurgence of anti-Semitism in France. The murder has shocked public opinion, and particularly the Jewish community. For many Jews, it makes little difference if the anti-Semitic character of the crime is proven or if it was simply committed by a psychopath. One understands the emotion of the Jewish community, for if the number of anti-Semitic attacks—which are relatively low—are not increasing in France, violent criminal ones are indeed. The murder of Mireille Knoll, who, as a child, barely escaped the July 16-17, 1942, Vel’ d’Hiv Roundup—when the French police handed over 13,152 Jews to the Nazi occupiers, who deported them to the death camps—is the latest in a series of macabre crimes to afflict the Jewish community. First there was the 23-year-old Ilan Halimi, who was abducted and sequestered for three weeks in January-February 2006 and tortured by his kidnappers before dying of the physical abuse that he had sustained. The ringleader of the self-proclaimed “gang of barbarians,” the 25-year-old petty criminal Youssouf Fofana, said that Halimi, who was an employee in a mobile-phone shop in the same part of Paris where Mireille Knoll lived, was kidnapped for ransom, as Jews “have money.” Then there was the attack at the Ozar HaTorah school in Toulouse in March 2012, when three children and a rabbi were shot dead point-blank by the jihadist Mohammed Merah, who had killed three French soldiers—two of whom were Muslim—over the previous week. Finally, in January 2015, four people were killed in the attack on the kosher supermarket in Vincennes, a suburb bordering Paris, in the wake of the massacre at the office of the satirical weekly Charlie Hebdo. To this, one may add the April 2017 defenestration of Sarah Halimi, another elderly Jewish woman in Paris killed by a neighbor, bringing to 11 the number of people killed in France over a 12-year period simply for being Jews. This is unique in Europe. Leftist leader Jean-Luc Mélenchon and his entourage had to leave the march called by the CRIF in honor of Knoll, whereas Marine Le Pen and her associates managed to remain in it longer, protected as they were by militants of the Jewish Defense League. When the CRIF’s president issued the call for the marche blanche, however, he added an astonishing caveat, which was that neither Marine Le Pen of the far right-wing National Front (FN) nor Jean-Luc Mélenchon of the leftist La France Insoumise (FI) were welcome at the march, nor were other officials of their respective parties. The FI, which is made up in part of former members of the Socialist Party (PS), has become the principal formation of the French left since the calamitous score of the PS candidate in last year’s presidential election. FI leader Mélenchon came in a close fourth place, with 19.6 percent of the vote, in the first round of the presidential election (with first-place finisher Emmanuel Macron obtaining but 24 percent). For her part, Marine Le Pen (who took 21.3 percent in the presidential first round) heads a party with an anti-Semitic history, though it is much more focused on Islamophobia nowadays. Both Mélenchon and Le Pen showed up at the march, despite the CRIF’s peremptory command, where they—and particularly Mélenchon—were met with catcalls by some of the marchers. What followed was symptomatic of the present state of mind of a part of the organized Jewish community. 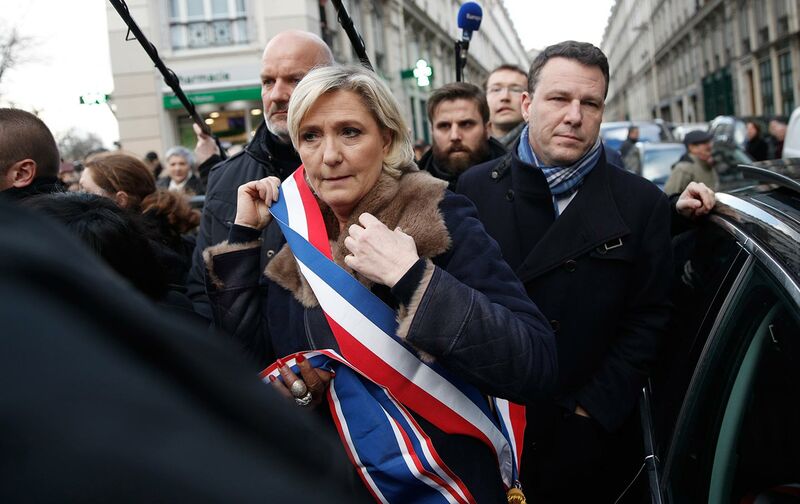 Mélenchon and his entourage had to leave the march, whereas Le Pen and her associates managed to remain in it for longer, protected as they were by militants of the Jewish Defense League (LDJ), with which the FN maintains a good relationship. The LDJ is the French version of the American Jewish Defense League, which was founded in 1968 by the Brooklyn rabbi Meir Kahane. On the Zionist far-right fringe, the LDJ is a tiny organization and thoroughly unrepresentative of French Jewry, but is determined, extremist in its rhetoric, and violent in behavior. The LDJ’s anti-Arab, anti-Muslim racism is manifest, with its militants regularly accused of committing acts of aggression against Arabs, or those presumed to be, and of issuing threats to the physical integrity of people, including Jews, who are critical of Israeli policies. The attitude of the CRIF toward the LDJ is ambivalent. It does not defend the LDJ’s positions or practices but systematically allows the group to informally act as marshals at CRIF-organized demonstrations. As for the LDJ, it maintains an open relationship not only with FN militants but also with even more radical, fascistic groupings, with whom it finds common ground in the hatred of Arabs and Muslims. The “appropriation” of the anti-Semitism issue by the official institutions of French Jewry, who then bundle it with unconditional defense of Israel, is, quite simply, disastrous. The Israeli-Palestinian conflict seems not to interest Mélenchon much, as he has rarely spoken out on the subject. But many militants of his movement, the FI, have been strongly critical of Israeli policy toward the Palestinians, and with some supporting the Boycott, Divestment, and Sanctions (BDS) movement (which is marginal in France). This is why the CRIF felt it imperative that Mélenchon be excluded from a demonstration denouncing an anti-Semitic act. This “appropriation” by the official institutions of French Jewry of the anti-Semitism issue, who then bundle it with the unconditional defense of Israel, is, it may be said, quite simply disastrous. In this regard, it is a sad reality that parallel to the rise of anti-Semitism in communities of North and Sub-Saharan African origin—who populate the lower-class housing projects on the periphery of French cities—is a growing hostility to France’s Muslims within the Jewish community, and which draws its source in the defense of Israel. In each of these communities, the sentiment of being a “victim” predominates, for France is unique in that it is the sole country to have a collective guilty conscience toward both its Jews and its Arabs: toward its Jews, for the active collaboration of the Vichy regime with the Nazi occupier; toward its Arabs, for the colonial history in North Africa and the crimes committed by the French army during the Algerian war of independence. Moreover, the respective integration of Jews and Arabs in contemporary France has not followed the same rhythm. Jews today are well integrated into French society and experience no discrimination, social or otherwise. By contrast, those of Arab origin, who are heirs to the immigration wave of the 1950s through the 1970s, which was driven by labor recruitment of French industry, face discrimination in employment and housing—not to mention harassment by the police—which has been incontrovertibly documented in numerous studies. To this may be added the open sore of France’s colonial past. The rising anti-Jewish racism in France’s Muslim communities of recent immigrant origin is essentially a racism driven by feelings of exclusion, by ignorance (“Jew, Israeli: What’s the difference?”), and by classic anti-Semitic clichés (“Jews are rich,” “Jews dominate the world,” and so on). The Islamophobia that is increasingly infecting the Jewish community is, for its part, anchored in old colonial prejudices, and is even more pervasive in the larger French population (“Islam is, by its nature, a retrograde religion,” “Muslims want to Islamize France,” and the like). Sylvain CypelSylvain Cypel has been deputy head of the international section, chief editor, and permanent US correspondent for Le Monde. He is the author of three books, Walled: Israeli Society at an Impasse (2007); and (in French) A New American Dream (2014) and Liberty (2016).